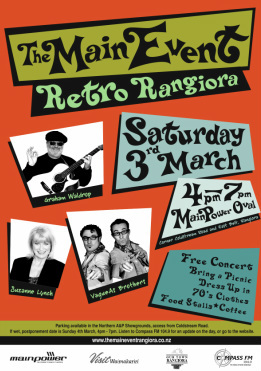 FREE COMMUNITY CONCERT - THE MAIN EVENT. Bring along your friends and family, your picnic basket and rug, get into the theme and dress up in 70's clothes and enjoy an entertaining afternoon of music with Suzanne Lynch, Graham Waldrop, Sneaky Feet, the Vague as Brothers and MCs The Outwits. Food stalls and coffee available.